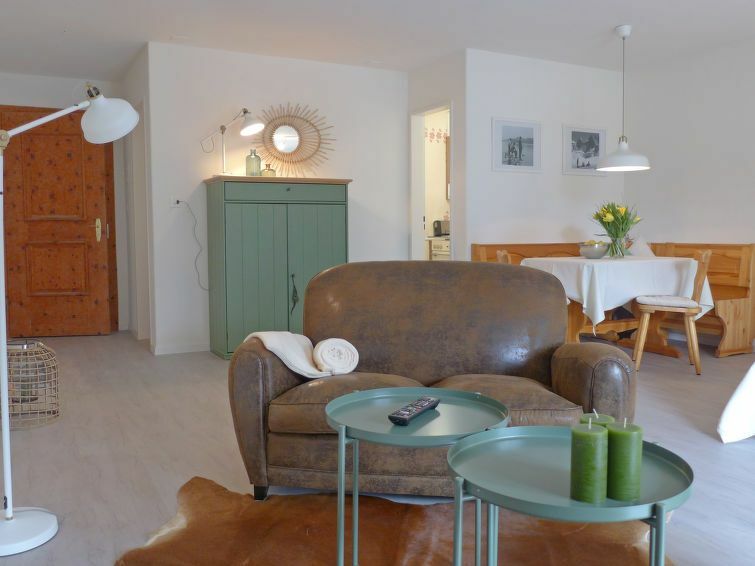 Madulain 15 km from St. Moritz: Small apartment house "Chesa Bursella 21", detached. In a quiet, sunny, elevated position. For shared use: large garden. Bus stop 500 m, railway station "Madulain" 500 m. Golf course 2 km, cable car 12 km, ski lift 2 km, cross country ski track 700 m. Please note: Loading and unloading of baggage is possible at the holiday house. The keys‘ handover takes place by the agency Interhome AG in St. Moritz, 14 km. "Chesa Bursella 21", 1-room apartment 41 m2 on 1st floor. Spacious, partly renovated in 2017, cosy furnishings: open living/sleeping room with 2 beds (90 cm, length 200 cm), dining nook and TV. Exit to the balcony, east facing position. Small kitchen (4 hot plates, oven, dishwasher). Shower/WC. Balcony furniture (2). Very beautiful view of the mountains and the valley. Facilities: hair dryer. Internet (WiFi, free). Garage space n 21. Please note: maximum 1 pet/ dog allowed. No lift. Very nice studio apartment with a great view from the balcony. The directions we got for arriving at the condo building were somewhat inadequate given that there are no address numbers on the building and the name of the building was not visible from the street. The kitchen was adequate for a short stay but it had only one electrical plug so making coffee or heating water for tea or making toast became a cumbersome task.One more outlet for the counter would be nice.The linens were nice. The two beds were pushed together to make a queen size bed but with a huge division between them that was uncomfortable. The bathroom is very small.Very little space to put anything. How about putting a few more shelves and some light. The light bulbs were all around 15 watts each,at night it was totally inadequate.WiFi was ridiculously slow to non existant. Our stay was pleasant enough but the apartment was extremely spartan.A few items could make it a 5 star property. One must walk up quite a few stairs with luggage and groceries to enter this apartment! Meine Frau und ich haben den Skiurlaub in der Wohnung sehr genossen. Die Lage ist sehr ruhig, die Ausstattung ist komplett und sehr geschmackvoll. Bad und Küche sind zwar klein, dafür ist der Wohnraum um so großzügiger.